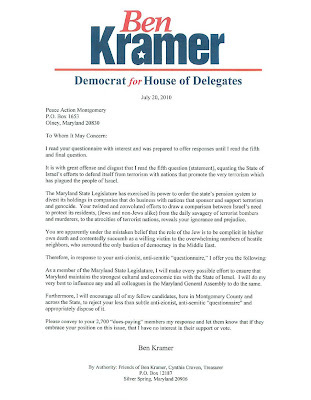 Delegate Ben Kramer (D-19) and Senator Mike Lenett (D-19) have responded harshly to a question by Peace Action Montgomery on its recent questionnaire to MoCo candidates. OK, "harshly" doesn't do it justice! 5. In the past, the Maryland state legislature has exercised its power to order the state’s pension system to divest its holdings in companies that are complicit in illegal activities in other countries. The World Court has ruled that Israel’s separation wall and settlements in the West Bank are illegal. Would you support a similar divestment bill targeting companies that knowingly participate in these illegal activities in Israel? I read your questionnaire with interest and was prepared to offer responses until I read the fifth and final question. It is with great offense and disgust that I read the fifth question (statement), equating the State of Israel's efforts to defend itself from terrorism with nations that promote the very terrorism which has plagued the people of Israel. The Maryland State Legislature has exercised its power to order the state's pension system to divest its holdings in companies that do business with nations that sponsor and support terrorism and genocide. Your twisted and convoluted efforts to draw a comparison between Israel's need to protect its residents, (Jews and non-Jews alike) from the daily savagery of terrorist bombers and murderers, to the atrocities of terrorist nations, reveals your ignorance and prejudice. You are apparently under the mistaken belief that the role of the Jew is to be complicit in his/her own death and contentedly succumb as a willing victim to the overwhelming numbers of hostile neighbors, who surround the only bastion of democracy in the Middle East. As a member of the Maryland State Legislature, I will make every possible effort to ensure that Maryland maintains the strongest cultural and economic ties with the State of Israel. I will do my very best to influence any and all colleagues in the Maryland General Assembly to do the same. Furthermore, I will encourage all of my fellow candidates, here in Montgomery County and across the State, to reject your less than subtle anti-zionist, anti-semitic "questionnaire" and appropriately dispose of it. Please convey to your 2,700 "dues-paying" members my response and let them know that if they embrace your position on this issue, that I have no interest in their support or vote. I wholeheartedly share the views so well expressed by Delegate Ben Kramer in his letter to you dated July 20, 2010. I take extreme offense at Question 5 of your survey, which equates Israel’s defensive actions to protect its very existence with the actions of nations that sponsor terrorism. Delegate Kramer said it all and I could not improve upon his words. Like him, I will dispose of your questionnaire and I do not care what you convey to your members. Several other politicians tell us that they did not bother to send back the questionnaire because of the anti-Israel question. As a result, this will go down as one of the least effective questionnaires of the cycle.